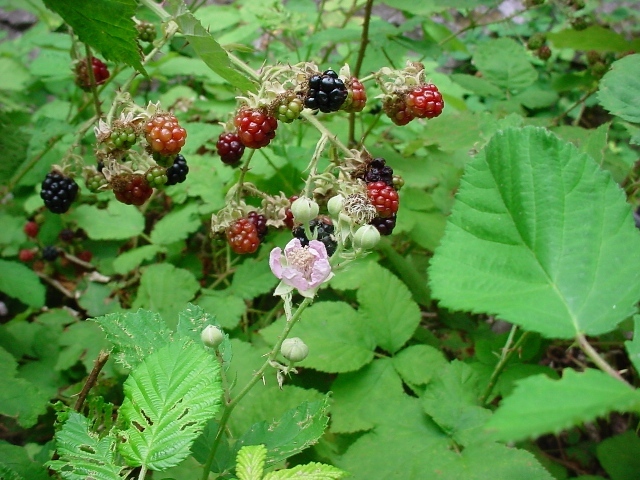 Black cap raspberry is a plant of West North America and is believed to have originated in that region only. It can be seen growing in West North America from British Columbia, Canada to California, New Mexico and even part of Mexico. It bears small blue fruits which are tasty and fondly eaten by local people. It is not grown on commercial scale. A thicket forming shrub with arching habit (many branches arch back to the ground), growing upto 6 2 m tall, round stems covered with white bloom and armed with curved, flattened prickles. Leaves alternate, compound, deciduous; young leaves typically have 5-7 leaflets while older leaves have 3; leaflets are broadly ovate and coarsely toothed, crinkly in appearance, green above and either paler green or white below with soft hairs. Flowers small white to pink, less than 2.5 cm across; occur singly or in clusters of 3-7 terminally or in leaf axils. Fruits purple or black, covered in a whitish bloom each 12-15 mm across; distinctly hairy; initially red but darken with age, edible and very tasty when ripe in late summer. Black cap raspberry fruits are very tasty. These are eaten as such and also cooked in pies jams etc. The fruits can also be dried for use during winter. This fruit, though very tasty, is too soft and therefore is not suitable for commercial cultivation. A refreshing tea is also made out of its leaves. The young shoots of black cap raspberry are very soft. These are peeled and eaten as salad. This fruit is also reported to have medicinal value. The whole plant is astringent. An infusion of the root or the leaves has been used in the treatment of diarrhoea and upset stomachs. A mild infusion of the roots has been used in the treatment of influenza. 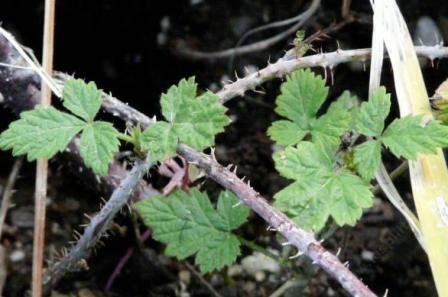 A poultice of the powdered stems has been used to treat cuts and wounds. 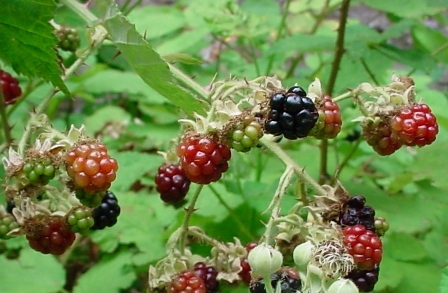 Though black cap raspberry is not cultivated commercially and planted only as a specimen plant in gardens, but it is quite easy to grow. Sunny locations areideally suited for this fruit. Though it is possible to raise new plants from seed, but it requires cold stratification for 406 weeks before sowing. Semi-hardwood cuttings also root without difficulty. New plants can also be raised by tip layering.